Most of you know that we just (and I mean just) moved back to the Methow Valley. An opportunity arose that we couldn't pass up, so we are transitioning our coaching business, Cascade Endurance, and my massage practice to Mazama, just on the eastside of the North Cascades. I'll be working in Mazama Wednesdays and Fridays, starting in September. My online scheduler is updated with my new availability, and since I'll start with just part-time, the sooner you set your appointments, the higher probability that you'll get the slot you want. As always, you can email me at alison.naney@gmail.com or call me at 206-305-7447, if you'd prefer. 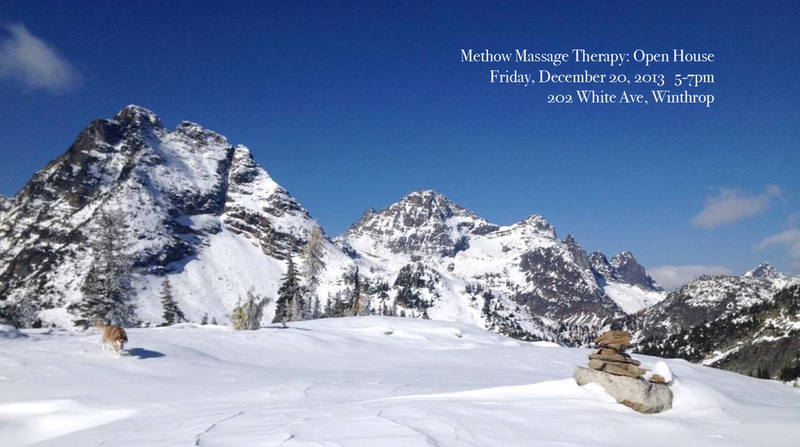 If you've never been to the Methow, you're in for a treat, and now you have a local massage therapist. After many long days of waiting, followed by many long hours of labor, I'm thrilled to introduce our little girl, Fiona Elizabeth Naney. She was born at 10:03 on Wednesday, May 28th. A petite little thing, she weighed 7lbs 12oz at birth, and was 7lbs 7oz when we left the hospital. So far this perfect little being sleeps through the night (!! ), feeds well, and only cries when she's hungry or needs a fresh diaper. I realize this will change, but in the meantime am taking full advantage of the time to recover. Nikki taking to her new role right away. Using a foam roller is one of the best things you can do for injury prevention, especially athletes. I became a fan when I increased my running volume to do a 100 mile race, but then really became a fan when I realized I didn't have to work as hard when my clients rolled between massages, And while I love working hard for my clients, I love longevity even more. By foam rolling between sessions, I can be more effective during each treatment session and clients see better results. You might feel tightness in your hamstrings and hips, but runners in particular benefit from rolling the quads and hip flexors. The front of the thigh and hip flexors often compensate for the glutes (especially if your glutes are weak), resulting in shortened, tight muscles. Working on hip extension is essential for this, both in your technique while running (work with a coach on this, or at least check out this book) and opening the front of the hips when you aren't running. Enter: the foam roll. Last weekend marked the second annual Rattler Trail Runs, put on by Methow Endurance, my other venture with Sam. There was a great turn out and while it was a bit chilly after the race, the temperatures were perfect for running. The Balsamroot flowers are popping and there were plenty of snow-capped mountain views. Women's 9-mile winner Heidi Dunn getting a head start on her recovery. Thanks, Dawn! Dawn came up to offer post-race massage, that many people partook of. Look for our tent at the Mazama 5/10k next month. The hills are greening up! Mt. Gardner in the background. Photo courtesy of Pat Leigh. This weekend marks the beginning of the trail running season here in the valley, with Methow Endurance's Rattler Trail Runs. The run highlights the beautiful Pipestone canyon, at the best time of year: snow-capped mountain views, wild flowers, the smell of sage, sun, and a mix of fun, technical trails and smooth, fast doubletrack. Because it's early season, there are several distances to choose from: four-mile, nine-mile, and half-marathon. Looking toward the finish of the 9-mile and 1/2 marathon course, with Mt. Gardner in the distance. To celebrate the start of spring running, we're going to be at the finish area offering free 15-minute sports massage sessions to speed your recovery. These quick treatments reduce inflammation, increase range of motion, and prevent cramping (in addition to feeling really good), allowing you to spend less time stiff and sore and more time out on the trails. In addition, if you're running the race this weekend, you can get 15% off an hour massage in our Winthrop office, either this week or next. Book online or call the office at 509-996-3222. Your legs will thank you! New Therapist and Spring Special! I'm thrilled to announce that Dawn Heath, LMP, is joining Methow Massage Therapy! Dawn brings with her five years' experience in deeply relaxing clients' bodies and minds. To celebrate the addition (and increased availability, especially Saturdays), we're offering a special. Schedule an appointment or purchase a gift certificate (Valentine's Day, perhaps?) with Dawn for $55 from now until March 15. As always, you can also schedule and buy gift certificates by calling the office at 509.996.3222. Read more about this lovely lady (and talented bodyworker) here. We are lucky to have her! To celebrate my new business name, improved space, and (almost) the return of light, I'm hosting an open house from 5-7pm on Friday, December 20 at my Winthrop office. I'll be raffling off a few gift certificates and will have light munchies and drinks. I'm located in the Winthrop Physical Therapy building and would love to see you there! After months of fine tuning, my new logo and website are here! I'm still figuring out the new platform for my site, but until then, take a look around and let me know what you think.